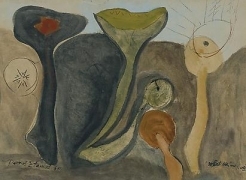 The rich connection between the natural world and aesthetic realm of the Abstract Expressionist painters has long engaged critics and curators. During the mid-century period, this complex subject was discussed and debated in such landmark essays as Clement Greenberg’s 1949 “The Role of Nature in Modern Painting” and Frank O’Hara’s 1954 “Nature and the New Painting.” In its upcoming exhibition, Hollis Taggart Galleries focuses on the symbiotic relationship of nature and abstraction though the lens of four celebrated artists: Hans Hofmann, Joan Mitchell, Richard Pousette-Dart, and Theodoros Stamos. For many artists, understanding of the natural world was based not simply on observation but on the science and sociology of the age. The era was witness to the development of penicillin, the electron microscope, mapping of the ocean floor, the beginnings of space exploration, and the development of molecular biology. In geographical terms, many artists moved their studios to the countryside and began to execute studies out-of-doors. 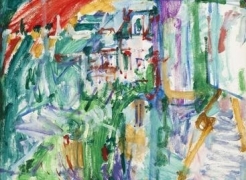 Hans Hofmann would carry his easel and paint box onto the dunes of Provincetown to create vibrant and dynamic imagery such as Sunburst (1942), a virtual celebration of nature. 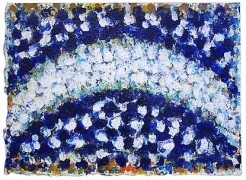 Richard Pousette-Dart moved his family from New York City to the lush wooded area of Rockland County, New York and reconnected with the natural world in extraordinary paintings like Byzantine Night (1964), distilling the radiant night sky into a visual painting field unto itself. Joan Mitchell and Theodoros Stamos retreated into nature quite literally and metaphorically. 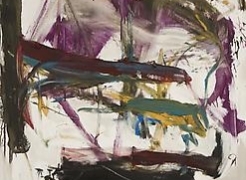 Joan Mitchell’s Untitled (1957) with its striking gestural brushwork and turbulent energy mirrors the tempestuous forces of nature. Such work stands in stark contrast to Stamos’ Sun Box—Tundra (1964). Stamos’ subtle color poetry reflects a special sensitivity to the complex nuances of light and atmosphere. His composition is the very embodiment of a quiet and contemplative experience in nature. Each of these artists turned to nature as a core subject. They responded in their own unique language to a contemporary cultural zeitgeist that was tied to the natural world and to advances in the natural sciences. Why Nature? is accompanied by a fully-illustrated catalogue with an essay by Robert S. Mattison, Marshall R. Metzger Professor of Art History at Lafayette College and author of Robert Motherwell: The Formative Years (1987), Grace Hartigan: A Painter’s World (1990), and Arshille Gorky: Works, Writings (2010).